For the purpose of providing the finest Vertical Autoclave, we engage in using the finest raw materials and advanced technology in its manufacture. Used for the purpose of processing various materials, its performance is highly appreciated in the market. This range is made available to clients at the best rates possible. Owing to our rich experience in this domain, we have been able to offer premium quality Vertical Autoclave to our prestigious customers. 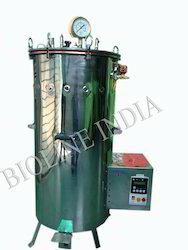 The offered autoclave is commonly used for effective sterilization of different medical equipment. Due to their steady performance, these devices are highly demanded in the market. Pressure: 15 lbs. to 22 lbs.